It has to be one of Ireland’s greatest walks. 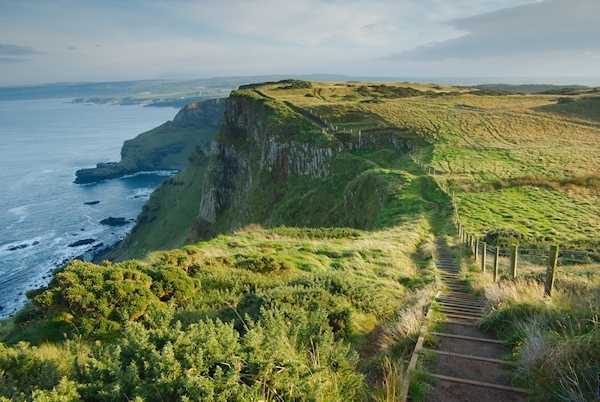 The North Antrim Coast is fully accessible and waiting to be enjoyed: all the way from Carrickarede to the World Heritage Giant’s Causeway. Do it on your own or, better still, walk it with Paul Quinn. Paul is a local who has seen the Causeway in all weathers and still finds things to marvel at and enjoy. If you want to find out more, please contact Paul. You will need to be reasonably fit and agile. Paul acted as guide to Louise Roddon, a journalist with The Times. Here is what Louise said of her Causeway walk: …This magical moment was the first of several during my days here, which included some of the Causeway Coast Path’s lesser-known stretches. For these unsung parts I would recommend Paul Quinn – a walking guide with impressive knowledge of the region’s flora and fauna.